The Birdies were created following a silly conversation and a glass of wine or two! The Birdies are based on people I observe in everyday life, but from a bird's eye point of view... A teenage sparrow "Tweeting" his mates; "Birds of a Feather", twin sisters wearing identical knitted coats and red sandals on a day out; "Swan Song"; Sick as a Parrot; Doing Bird....these characters perform in their own private comedy sketches, for us to take a shy peek into... and fall in love with. The Birdies are available as licensed properties for greetings cards, dinnerware, plush, 3D sculptures etc. 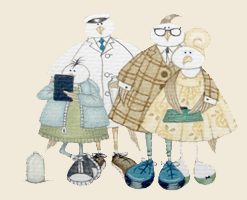 This website and its content are the copyright of Linda Jane Smith, artist, illustrator, designer, creator. Copyright © 2013 Linda Jane Smith. All rights reserved.